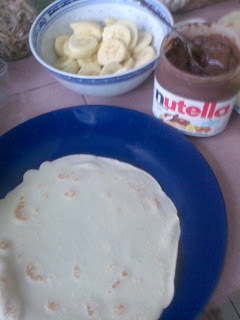 Yesterday I made crepes filled with nutella & banana slices after reading about a flogger experience eating it on the streets of France. I thought it sounded delicious & I wanted to make it for my family. Yeah, the 1 week semester break is being push earlier due to the pandemic of H1N1.Thus, I’m back at home sweet home but the lull of my super comfy bed is making it hard for me to do my assignments or cracking my thesis.hehe.Damnzzz.Oh,here’s a picture of me making the crepes with nutella & banana slices. 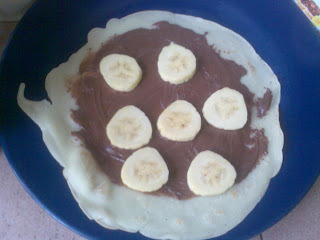 The crepe recipe can be found in one of my old post with the name Sweet Crespelle. This picture below is something that I concocted last week because lately I love eating red capsicum. Probably because my family has been eating the new Pizza Hut Mediterranean Chicken pizza a few times& they put red capsicum on top(usually they use green capsicum on their pizzas)which got me addicted to it. 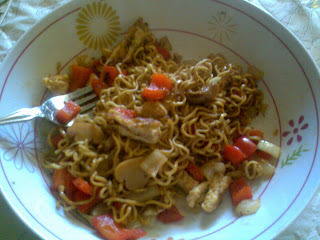 So now, I love oven roasted red peppers in everything & put them in my bowl of Mee Sedap. The red peppers are sautéed with button mushrooms & chopped onions with a lil’ bit of salt & mix with the prepared Mee Sedap Mi Goreng Biasa(I could eat it every week, I know, that’s bad!) with strips of omelette. Yummah! 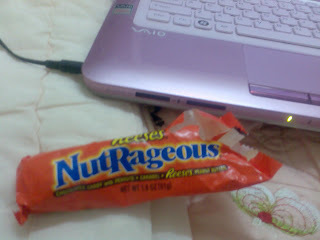 This my fave candy bar...Reese’s Nutrageous.. Peanut butter+caramel+chocolate+peanuts=candy bomb goodness in the mouth..I’ve refrain myself from eating them for months because I don’t trust myself around it.I’ve successfully manage to finish 1 Nutrageous in 1 & ½ days & not a few hours..Yeah! (the trick is putting it in the fridge & breaking it into pieces instead of carrying the whole thing around because you may just finish the whole thing! Talking about candy,I remembered about this old post on Serious Eats that I read a month ago that made me so envious & day dreaming that I could go to THIS candy expo...WALAHWEI(a disbelief expression)!!!! !The array of candy was just amazing!I wish there was a store like Dylan’s Candy Bar(in NY & there’s many more across the States) would open one in Malaysia..sigh. wahhh! yummmy!!! can i have some??? hehe.